Glob sent Enzo a box of Natural Color Blend Packets to play with this week. I think it's safe to say that I will never buy conventional paints again. Yeah, I definitely won't. I'm smitten with Glob. The paints are made from fruits, vegetables, flowers, and spices with natural food-grade ingredients. 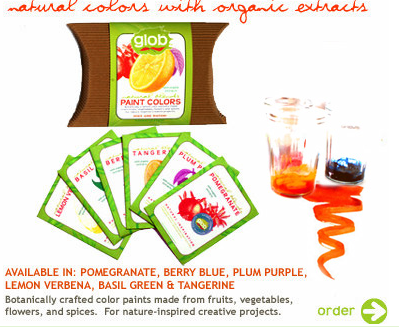 Every box comes with a packet of 6 colors; lemon vebana, blueberry, pomegranate, tangerine, plum purple, and basil green. It comes in packets with powder which you then add water to until you reach the consistency that you like and BAM! Paint! Beautiful, vibrant, incredibly fruity smelling paint. And today we get to giveaway a box of Natural Color Blend Packets to you. We hope you win but if you don't I think Glob paints would be a very fun Christmas gift so add it to your wish list. They seriously have their ideas in the right place, specially about the environment. 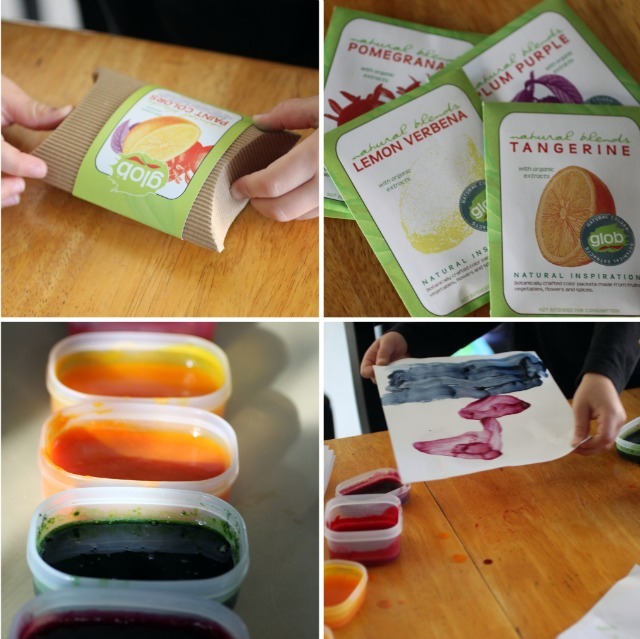 All the paints are 100% biodegradable, there is minimal packaging, and a little goes a long way. To Enter: You have to be a Kitchen Corners follower. If you're already a follower leave a comment saying hi. If you're a new follower leave a comment introducing yourself and if you have a blog and would like to leave your url please do so. I enjoy meeting my readers! Please make sure your comments link back to an e-mail address so I can contact you if you win. Giveaway closes: Midnight PST Thursday December 9nd. The winner will be contacted via e-mail and announced next Friday. post-edit: The giveaway winner is FootPrints. Enjoy. wow that is awesome- esp for kids- you dont have to worry about them eating it. HOLY SHNIKIES this is cool. i shared the link on Facebook....that's how badly i want it. ps: i love that you have joined the two blogs...or at least it seems you have. i love your blog! I'm already your follower and I love those paints :) Is this giveaway for anyone and anywhere? wow, they look awesome Da. I think I need to get me some glob too! i am a follower on facebook. these pains look amazing! These paints look super neat! Maybe a good Christmas present??? Thanks for sharing! These look like fun! I hope I win! So happy to have followed you over to this blog! @Anncoo yes. it's for anyone and anywhere. Whoa. That is cool. Smelly paint? I bet Amaya will try to eat it. Do I follow you? I certainly subscribe and check obsessively for new posts. I'll push the button right now. I've been following but just made it official I guess! 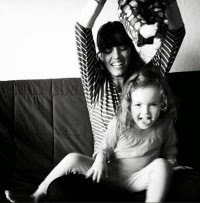 :) LOVE your blog and hearing about your family. These paints look like SO much fun I know my kiddos would love them! I have been following for a couple of months now. I also have two small children, one picky eater and one who will eat anything! I love how honest you are on your blog and love your thoughts about food. Thanks! I follow...these are so cool! Very cool -- my best friend would LOVE these...and I'd love to give them to her! I subscribe through RSS as well. Those look great! My boys would love playing with them! I am a follower and I adore your blog, Da. These paints look good enough to eat - and I guess they are! I am a follower, I think! or if not, I will be one in five seconds! These colors sound amazing and something I want to try for sure! What a great idea! !..Specially for toddlers! Love finding out about products like these! HI!! Does this giveaway have a geographic restriction? Lol, never mind, either way I'm gonna go follow you on Twitter now! Hello all! I am a new GFC follower. Nice to meet you all! I am following you in my google reader. I am following you on FB and twitter @rusthawk. I shared your giveaway on FB! Happy Holidays! hi, i'm new to your blog, i started reading it about a week ago with your thankful post. my two-year old daughter, Elsa would love to play with glob, and even if we don't win your giveaway, i'm glad you shared this product with us because now, we'll have to find some for ourselves. Wow! Those are COOL paints... if I don't win I'll certainly buy them! Thanks for the introduction to them! I'm a new follower and have two kids (3 and 1) who love to paint. I've never heard of Glob before but I'm always looking for more natural alternatives to the usual. I have a little blog here: mysquishiesandveggies.blogspot.com. Oh and my husband lived in Brazil for 2 years and loved it! me likey. so please pick me! Namaste! I am a new follower on gfc (cpage2323 christine page). I was just turned on to your site from online-sweepstakes, but i will continue to check you out. I am very interested in making dyes from plant matter. I also make my own own cheese and paper, but do not have my own blog. this would be cool to win. I would be interested in the consistency and depth of colour. Thanks for the chance! Hi, and I now follow-carol lewis. This looks just wonderful! I would love to try this with my grandkids! I follow you on Twitter-dresdenrain. I like you on FB-carol yerby lewis. I shared on FB-carol yerby lewis.